In fact, it was a novel – Amitav Ghosh’s The Glass Palace, a dramatization about the exile to India of the last king of Burma by the British in 1885 and the fate of his family. It is an excellent (and historically astute) reconstruction with Ghosh’s usual literary brilliance. Yes, it allowed me to visit a number of places from which ‘potentates’ were banished or to which they were exiled – the old palace and temple of the last king of Kandy in Sri Lanka; the reconstructed palace of King Thibaw in Mandalay and the tomb of the exiled Mughal emperor Zafar in Rangoon, Burma; the former imperial palace and royal tombs of the Vietnamese emperors in Hué; and Reunion Island in the Indian Ocean, where the French exiled the last queen of Madagascar, two Vietnamese emperors, and a sultan from the Comoros islands. The sense of discovery: the lives of these fascinating, but now often unknown, rulers who were exiled, and my own explorations of the history of places as diverse as Morocco and Vietnam, India and sub-Saharan Africa, Burma and Madagascar. Trying to bring together in (I hope) a coherent study cases of the dethroning and exile of several dozen figures from very different societies through Africa and Asia over a period of almost 150 years. I have published – as author or editor – around 30 books. It has been a long time ago (in the mid-1980s), but it made me feel that I had chosen the right speciality and profession in becoming a historian and an academic. MUP’s ‘Studies in Imperialism’ series is the most prestigious series in the field of imperial and colonial history. 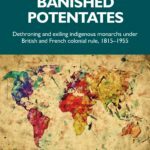 I contributed a commissioned chapter to a volume to mark the publication of the hundredth book in the series, and I’ve co-edited with Cindy McCreery two other volumes for the series – Crowns and Colonies (published in 2016) and Royals on Tour (to be published in 2018) – as well as authoring Banished Potentates. Not really, though the coverage of materials over so many countries and a long period meant that I had to ‘tutor’ myself in the histories of many different countries. Royals on Tour: Politics, Pageantry and Colonialism (edited with Cindy McCreery) has now been submitted. Meanwhile, Dr McCreery and I are editing a special issue of the Royal Studies Journal (for publication in 2018) on royal visits to the (British) Dominions of Australia, Canada, New Zealand and South Africa in the twentieth century. 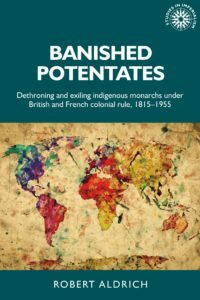 We also continue our research on monarchy and colonialism, and are organising a conference on ‘Monarchies, Decolonisation and Royal Legacies in the Asia-Pacific’ to be held in December 2017. I am also under contract with Palgrave Macmillan to write a book (with John Connell) on Fragments of Empire: Paradoxes of Colonialism in a Postcolonial World, which will update a volume we published twenty years ago on ‘leftover’ colonies and also discuss some new examples of neo-colonialism (i.e., Russia in Crimea, China in the South China Sea). Banished Potentates is available to pre-order now!